On this week's episode, WisPolitics.com's JR Ross and WisconsinEye's Steve Walters discuss Foxconn, the Supreme Court taking up a lawsuit over extraordinary session laws, Lincoln Hills and more. On this week's episode, WisPolitics.com's JR Ross and WisconsinEye's Steve Walters discuss Appeals Court Judge Lisa Neubauer conceding in the Supreme Court race, the continuing fight over Gov. Tony Evers rescinding appointments and the Marquette University Law School Poll. On this week's episode, WisPolitics.com's JR Ross and WisconsinEye's Steve Walters discuss a potential recount in the state Supreme Court race, the JFC hearings on Gov. Tony Evers' budget and Wisconsin being withdrawn from a lawsuit to void the Affordable Care Act. On this week's episode, WisPolitics.com's JR Ross and WisconsinEye's Steve Walters discuss the lame-duck rulings, the uncertainty over the 82 appointments Gov. Tony Evers withdrew and the state Supreme Court race. On this week's episode, WisPolitics.com's JR Ross and WisconsinEye's Steve Walters discuss the capital budget, recent court action on the lame-duck laws and Foxconn. On this week's episode, WisPolitics.com's JR Ross and WisconsinEye's Steve Walters discuss the selection of Milwaukee to host the 2020 Democratic National Convention, Gov. Tony Evers’ announcement of the two state-run youth prison sites that’ll replace Lincoln Hills, the U.S. Senate’s vote on a provision to block President Trump’s national emergency declaration and the 64th Assembly District race. On this week's episode, WisPolitics.com's JR Ross and WisconsinEye's Steve Walters discuss Gov. Tony Evers’ budget request; Department of Safety and Professional Services Secretary Dawn Crim’s 2005 child abuse charge that was later dismissed; and cabinet secretaries’ salaries under Evers compared to former Gov. Scott Walker. 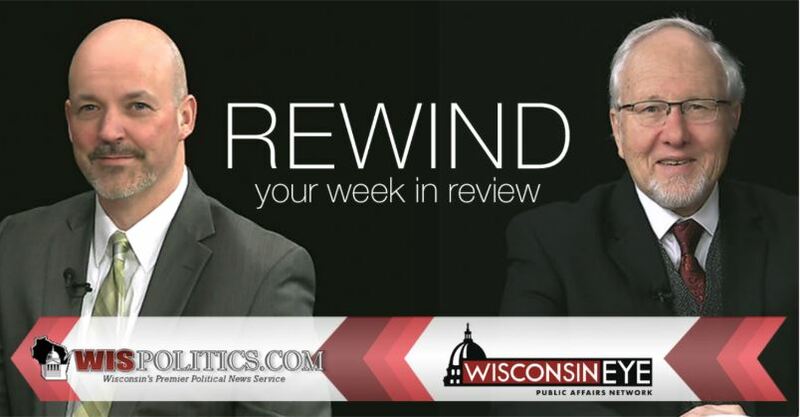 On this week's episode, WisPolitics.com's JR Ross and WisconsinEye's Steve Walters cover Gov. Tony Evers’ inaugural budget address. On this week's episode, WisPolitics.com's JR Ross and the Capital Times’ Jessie Opoien discuss the upcoming budget announcement, Gov. Tony Evers’ veto of the GOP middle-class tax cut plan and the state Supreme Court race. On this week's episode, WisPolitics.com's JR Ross and WisconsinEye's Steve Walters discuss the standoff over the middle class tax cut, the controversy over the Black History Month resolution and new budget initiatives announced by Gov. Tony Evers on water. 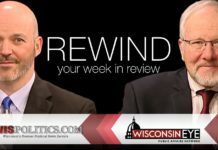 On this week's episode, WisPolitics.com's JR Ross and WisconsinEye's Steve Walters discuss the competing version of the tax-cut plan; the timeline for the state budget; and possible revenue options for road funding. On this week's episode, WisPolitics.com's JR Ross and WisconsinEye's Steve Walters discuss the latest developments from Foxconn, revenue estimates and Gov. Tony Evers’ plan to delay closing Lincoln Hills and Copper Lake juvenile prisons by two years. On this week's episode, WisPolitics.com's JR Ross and WisconsinEye's Steve Walters discuss Gov. Tony Evers' State of the State speech, the back and forth over the withdrawing from the state’s involvement in the Affordable Care Act lawsuit and the Marquette University Law School poll results. Gov. 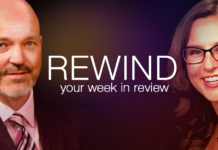 Tony Evers’ push to expand Medicaid; the debate over legislation to ensure health coverage for those with pre-existing conditions; Evers’ plan to include include a first step toward legalization of medical marijuana in his budget proposal; and more. On this week's episode, WisPolitics.com's JR Ross and WisconsinEye's Steve Walters discuss inauguration festivities, Assembly Speaker Robin Vos staffing up and the flurry of legal action at the Capitol.